Dolceoro Mantra Bracelets are dainty and elegant inspirational jewelry. They emphasize for an optimistic, thougthfull, positive way of life. Choose from varity of phrases available. You have also the option to customize or personalize your Mantra phrase should you not see it among the available list. 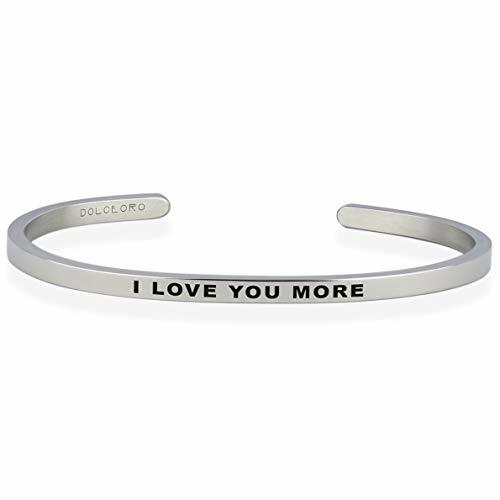 Simply choose the customizable listings from Dolceoro products to create your own unique jewelry to gift to yourself or to your love ones in your life. Adjustable to fit most wrist sizes of 6-3/4" to 7-3/4". For further details how to adjust your bracelet, please refer to the illustrated image for step by step instruction. This jewelry is made from Surgical Grade 316L Stainless Steel. It is hypoallergenic, lead, and tarnish free. Use lotion free liquid soap. It keeps the engraved wordings vivid and black, removes trapped body lotion, and lints from inside of the laser writings. Utilize lint free cloth to dry. If one isn't handy, use any cloth or paper towel. Dab on the engraving portion instead of rubbing against it. Remove any cloth lint from its surface using a scotch tape.